I am a fourth generation kama'aina with many years of business, sales and marketing experience. I grew up in Makiki and received my BA in Business Administration from the University of Washington and my MBA from the University of Southern California. After college I moved overseas to Taiwan where I was a headhunter for a large multinational management consulting firm. In Hawaii I ran a retail organization for several years where I trained every team member on how to provide excellent customer service. More recently as a consultant, I directed e-marketing and promotions for small, local companies. Francis and I reside on Waialae Nui Ridge with our two children and I enjoy cooking, running and family activities in my free time. 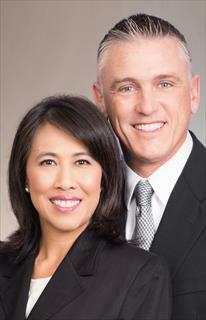 Along with my husband, Francis, who has many years of real estate successes, we will make sure your home is well represented or that your search for a new home or investment is successful. We have the experience and the skills.